The Cuba Libre (in English, "Free Cuba") is a highball made of Cola, lime, and white rum. This highball is often referred to as a Rum and Coke or a Coke and Sugar in the United States and Canada, where the lime juice is optional. Along with the Mojito and the Daiquiri, the Cuba Libre shares the mystery of its exact origin. The only certainty is that this cocktail was first sipped in Cuba. 1900 is generally said to be the year that cola first came to Cuba, introduced to the island by American troops. But “Cuba Libre!” was the battle cry of the Cuba Liberation Army during the war of independence that ended in 1878. Serve in a highball glass, on the rocks; poured over ice, garnished with lime wedge. The Cuba Pintada ("stained Cuba") is one part rum with two parts club soda and just enough cola so that it tints the club soda. The Cuba Campechana ("straightforward Cuba") contains one part rum topped off with equal parts of club soda and cola. They are both popular refreshments, especially among young people. 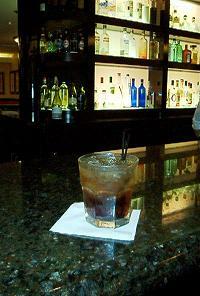 A recent variation is called the Cuba Light made with rum and Diet Coke. Another variation of the Cuba Libre is the Cuban Missile Crisis. Compared to a normal Cuba Libre, it uses a higher proof rum, such as Bacardi 151 (75.5%). An interesting variation of the Cuba Libre popular in the West Indies is a “Hot” Cuba Libre which includes a splash of Caribbean hot sauce (e.g. Capt'n Sleepy's Quintessential Habanero, or Matouk's).